The Oxford Primary Illustrated Maths Dictionary is specially designed to support the maths curriculum requirements at primary school. With comprehensive coverage of carefully-levelled maths terminology, clear definitions, and colourful illustrations, this is the perfect dictionar... read full description below. 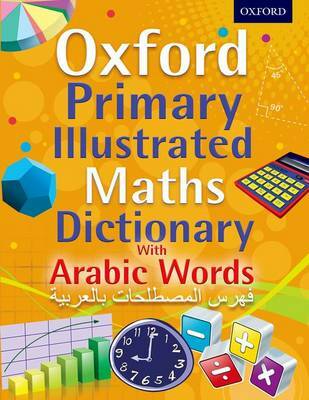 The Oxford Primary Illustrated Maths Dictionary with Arabic Words gives comprehensive coverage of the key maths terminology children use in the primary classroom together with their Arabic translations. Each entry is in alphabetical order and along with a clear and straightforward definition, has a fun and informative colour illustration or diagram to help explain the meaning. Cross references link the user to other useful words in this dictionary so it is easy to build up vocabulary quickly. There are full indexes in both English and Arabic. Additional information is given in a fully illustrated section on mathematical apparatus, symbols, calculations, and much more. It is the perfect companion to the Oxford Primary Illustrated Science Dictionary. Go online for free downloadable word games, puzzles, and activities on the www.oxforddictionaries.com/schools website.